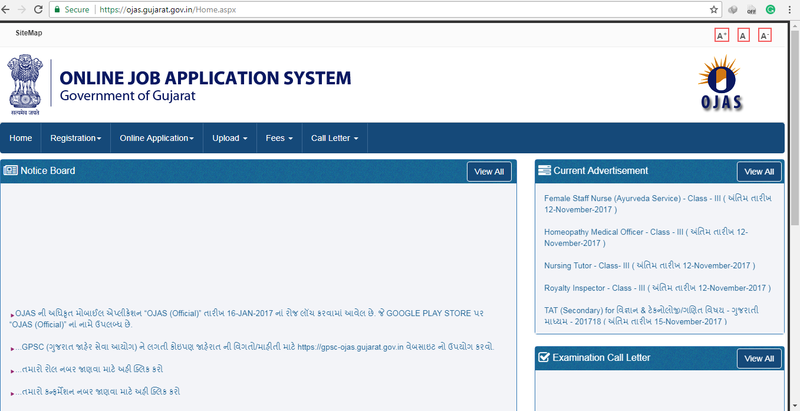 Ojas One Time Registration OTR | OJAS @ ojas.gujarat.gov.in: Online Job Application System is online web portal for apply various recruitment advertisement, download call letter, check Answer Key, submit fees and check result. 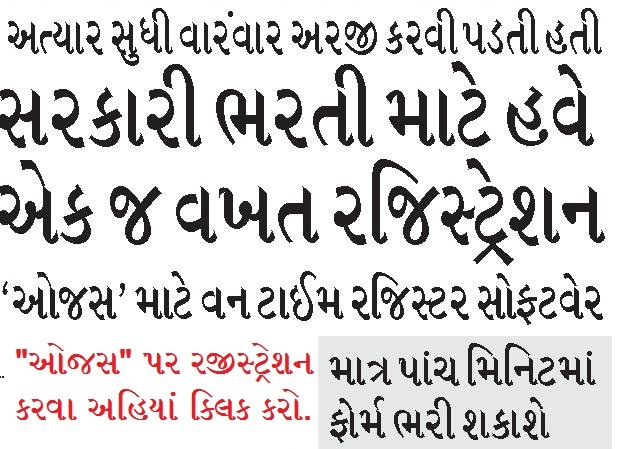 Ojas One Time Registration For New Gujarat Job Apply - ojas.gujarat.gov.in . you can Register For Ojas For Gujarat Sarkar Government Job .You Can Register In Gujarat Online Job Application System . More Details In Below. OJAS Registration , Online Job Application System for apply online application for recruitment advertisement. Now OJAS provides a new future One Time Registration OTR | OJAS @ ojas.gujarat.gov.in. OTR facility is additional facility for candidates convenience for online application. OTR facility is help to candidate for apply online for all the advertisement of Commission /Board/ Department. Today, We teach you how to use This OTR Facility. We understand this Facility step-by-step. Step 2: Go to Registration Tab which is shown below in Image. Step 3: Then in The Registration Tab Please Click on Apply Tab. Step 4: Then the Page comes Understanding Registration. In this Page, Everyone must read the Complete Page and Understand it. Then Click On I Agree. Step 5: Then Main Page Comes which Name is Registration. In this Page, You Have to fill up all Required Details. You have to fill Only Genuine Information for your OTR (One Time Registration). Step 6: After Filling up All The Details you have to upload Passport Size Photo and Signature in JPG Format. Note: Which is not greater than 15 k.b. in size. Step 7: Here you must agree with the declaration that all Information which is provided by you is Genuine and OTR is a Function only for Filling Automatic Details it does not mean That after this Process your Application will be automatically Apply. Step 8: After that, you will get OTP (One Time Password) on you Given Mobile Number you have to write that OTP to proceed further. Step 9: After giving OTP you get One Registration Number for this OTR (One Time Registration) on display and Also on Your given Mobile Number. Step 10: That's All, Your OTR (One Time Registration) is Completed. Then if you want this All information on the paper then you can Click on Print. The OTR facilitates the candidates to fill online forms for all the advertisements of Commission/Department/Board. The objective of OTR is to reduce the redundant task for the candidates while filling detail in online application. The OTR Registration number is added facility available to the candidate for applying online for all advertisements of GPSC. Getting OTR- ONE TIME REGISTRATION is only a facility and not consider/determine the eligibility of candidature. The Candidate can apply for online advertisement of Commission/Department/Board directly or with the help of OTR. The candidate has to apply online for all the current/upcoming advertisements and get a valid Application number and Confirmation number for the respective advertisement. And then only the application will be considered valid. OTR-is to facilitate the candidate for applying for online advertisements of the Commission/Department/Board that does not mean that it is a valid application for the respective or any of the online advertisement of the Commission/Department/Board. During the OTR process the Candidate has to fill all his/her personal details etc., and upload photograph and signature Online. After completion and submission of the same the candidate will get the One Time Registration number on the screen and on his/her registered mobile number. All the details submitted in the OTR can be edited. But during mentioning the OTR number while applying online application whatever details last saved while applying will be taken in the online form filling. If a candidate changes/modifies any data in OTR after applying for the online admission and getting confirmation number the same will not be taken into account of your valid application for the respective advertisement. The candidate can apply for online advertisements of the Commission/Department/Board with or without OTR.